We’d love your help. Let us know what’s wrong with this preview of Less and More by Keiko Ueki-polet. To ask other readers questions about Less and More, please sign up. Very difficult read. But worth it. Simplicity: the term is used so often these days that it requires elaboration. The 'simple' used in this exhibition does not refer only to shape, but to relations. To put it differently, it does not refer to the 'simple' box in which the product Very difficult read. But worth it. Simplicity: the term is used so often these days that it requires elaboration. The 'simple' used in this exhibition does not refer only to shape, but to relations. To put it differently, it does not refer to the 'simple' box in which the product's function is housed. It refers to the simplicity of the relationship achieved between the product's function and form. It is the simplicity resulting from the essential relationship between the given function and the form resulting from that which is both essential and reduced to the minimal. Thus it is opposed to the idea of making simplicity the final goal, or of making a simple shape unrelated to the original function of the product, or of 'simplicity for simplicity's sake' - as is the function these days. A simple product for the sake of simplicity will give rise to a product diametrically opposed to that objective. In other words the simplicity becomes a form of 'decoration'. If this statement bores rather than inspires you this book is not for you. Written as if the writings acompany a Rams' art installation (as the writings almost certainly did). 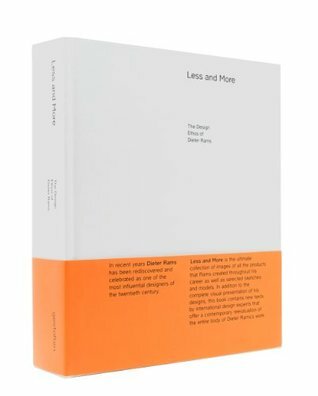 You'll find a bit of design philosophy (problems in aesthetics), history of Rams' design philosophy, as well as Rams' philosophy defined in the context of history. What you will not find is a biographical review of Rams. This is a potent book- mostly pictures; but the writing is quite impactful. Only problem is- I ended up highlighting an otherwise beautiful book. As an industrial design student I found it really inspiring and insightful. It's definitely a heavier read, and you'll probably have to go through it a couple of times to really understand where the various essayists are coming from, but in the end it's a solid look at some overarching topics in design philosophy. This is not for the casual person curious about design. Still, there's no denying it's an incredible collection of this iconic designer's work over many decades. The product photography is great, but the accompanying text is really only so-so, probably because it was translated from the German which is also presented throughout. best design advice ever...for any medium.